There’s a certain peace that comes when you know you’re about to fail a test. The folly of never studying and the consequence of failing embrace like long-lost friends, in which you’re surrounded by fellow students who actually did the work, and a teacher who will soon notarize your laziness. In sixth grade, on a Wednesday afternoon in Winnipeg, I was the only one with his head up in a field of dutifully downturned noggins. This wasn’t to be a slight failure, a 19 out of 40 marks, but something in single digit territory, one of those times where you pathetically feel a sense of accomplishment after correctly writing your name. Clearly, I had to cheat, but I hadn’t even prepared for that either. There was no cheat sheet I could surreptitiously glance at, and no friend who had been prepped to let me copy off their paper. Faking a sickness would have been an option had it occurred to me before the test, and not when there were five minutes left until pencils up. What was I supposed to do: suffer the consequences of playing video games all week instead of studying? Learn a lesson and work harder next time? Evolve? Not me. Since there was no way to pass the test ethically, and no way to pass it unethically, I heeded the advice of the supercomputer in War Games: the only winning move is not to play. You can’t get a bad grade when there’s no test to mark, right? 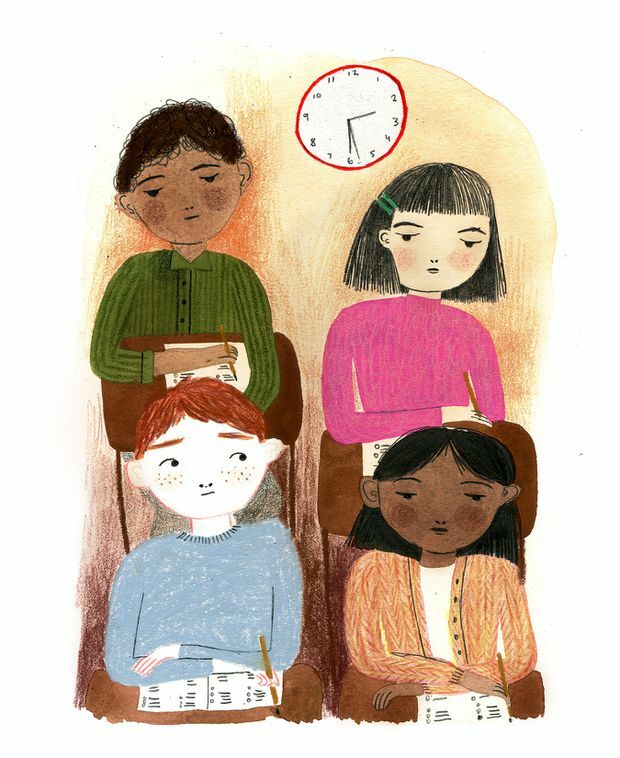 When time was up and classmates gradually rose to place their tests on the teacher’s desk, I rose with them, waiting until a big group walked to the front of the room, my hand clutching a sheet with more blank spaces than answers, and all of the answers wrong. A sea of arms sprang forth to release the tests onto the desk, and anyone looking upon the scene would have thought I did so as well. But in one motion I quickly folded the paper and slipped it into my pocket. “Totally aced that,” I remarked to a friend while taking my seat. The plan seemed ingenious to me in a sixth grade type of way. Because what kind of idiot would pretend to hand a test in? To walk to the front of the classroom, hold the test over the designated test pile, and not actually drop it? No one, especially not Chason, the adorable kid who otherwise had stellar grades despite his parents’ recent divorce and was a monolithic defenceman in pee wee soccer. When the teacher began handing back the marked tests later that week, I waited for mine with a falsified look of pure anticipation. “I put it on your desk like everyone else. You saw me. Maybe you dropped it,” I lied. And he did see me, everyone saw me, which is why his look of disbelief matched my own. Mr. Daniel was perplexed, while I felt guilt and shame spreading through me. Those feelings soon lost out though as I also discovered the newfound power of telling a big lie. You always remember your first. Like OJ, I maintained my story while the test was searched for, knowing it would never turn up. The time was passed for me in a montage of video games and street hockey, of fort building and cookie eating, none of which involved looking for or even thinking about the test. I knew the real one had been long flushed away into the Winnipeg sewer system, far from the reach of a judicial red pen. A new test was soon arranged and I took it in an empty classroom, where it seemed as though every other piece of paper had been removed except for the one in front of me. I sought to cleanse myself of past transgressions with a shiny new A. Maybe succeeding on this unearned second chance would ensure a long and healthy academic career, with only a single blot upon it. Maybe everyone has a missing test (a.k.a. big lie) in their lives and needs an opportunity to redeem themselves from a path of total darkness. Or maybe it was just a single test in Grade 6. As the school bells turned to years, the guilt was silenced not by achievement, but by a parade of further blots, including occasional cheat sheets, lame excuses for late essays, and skipping class when I didn’t think either of those tactics would work. Not getting caught in Grade 6 set off years of dishevelled ethics, in which I unfortunately learned that laziness and lies can go really well together. Though when the sloth gradually faded during the evolution into quasi-adulthood, so did the lying. Most of it, anyway. Despite my shenanigans, Mr. Daniel and I remained friendly afterward without ever discussing the test. When my family later moved from Winnipeg to London, Ont., it felt a bit like a getaway, and I haven’t had the chance to get back to Winnipeg since. Chason Gordon lives in Seattle.